Storm. Melt. Repeat. Snow continues to pummel the Midwest, leaving plenty of icicles and stratified layers of ice in gutters, downspouts and on rooftops. As the ice builds, so does the potential for serious damage to your home. Warmzone’s RoofHeat self-regulating heat cable provides the ideal way to melt ice and snow buildup in gutters, downspouts, and even the roof valleys and edges. Considering all of the damage caused by ice and snow, RoofHeat roof deicing systems are an investment worth considering. Why bother? Without a sound gutter melt system in place, in many instances, precipitation in the form of snow and water can freeze in gutters, downspouts, and along edges, creating ice dams. Once that happens, the ice continues to build, backing up under roof decking before finding its way into your home and causing costly water damage. Let’s face it, dedicating your time and energy to roof raking is extremely challenging. And removing dangerous icicles will not prevent the precipitation from steadily dripping, and freezing on your porch, before creating hazardous slip and fall conditions impervious to snow melting chemicals. RoofHeat systems provide a variety of benefits and the self-regulating heat cable ensures an effective way to keep your home or business safe from structural damage and dangerous conditions for pedestrians. Self-regulating heat cable is the “backbone” of a RoofHeat gutter heating system. It’s extremely effective, energy efficient and completely safe. Composed of a rugged, durable outer construction, RoofHeat cable can tough out the most demanding weather conditions to melt snow and ice from your roof. The self-regulating cable features an irradiated conductive core, so it responds to changing conditions, increasing heat output as temperatures fall, and decreasing heat output as temperatures rise, generating heat only when you need it. How does a roof gutter melt system work? 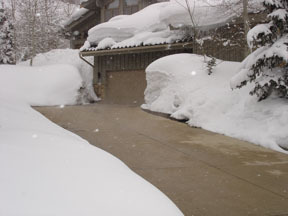 In response to weather conditions, the cable heats up and melts snow before any accumulation can form. Communication between RoofHeat cables, automatic sensors and a thermostat initiate snow melting, and continue working together to keep roofs, gutters and downspouts clear of ice and snow. There are no switches to flip, nothing to plug in and no raking to do. While you’re sleeping, at work or relaxing at home, Warmzone gutter and roof deicing systems are quietly working to protect your roof, and maintain the integrity of your home. Like most of us, you may find yourself on a shoestring budget. If so, then there is no better expert to partner with than Warmzone. Their professional designers will configure the best system to fit your particular situation and budget. Warmzone will carefully evaluate your needs and identify problem areas to come up with the best solution for you, and Warmzone provides personal installation support services. Before you spend one dime, you’ll understand the challenges of your situation and the best options to resolve them. Call Warmzone today to discuss your unique weather challenges this winter at 888.488.9276, or visit warmzone.com to learn more. FoilHeat under carpet heating systems are designed to efficiently provide heat under carpet, laminate and floating wood floors. The heating element installs easily and is very flexible, allowing for total wall-to-wall coverage. Because the heating element is so flexible, it can easily be cut onsite and turned at 90° or 180° to cover the intended area. FloorHeat Under Carpet heating systems feature a state-of-the-art design and premier quality construction. The floor heating system consists of fluoropolymer insulated heat cable that is sandwiched between two thin layers of specially reinforced aluminum. The uniform spacing of the heating elements and the aluminum ensures a nice, even heat distribution. Easy to Install: The thin rectangular mats can be cut onsite and do not require an adhesive. Requires no Floor Buildup: Because the heating mats are so thin (only 1/16-inch), no floor buildup is required. Energy Efficient With virtually no heat loss, the system boasts outstanding energy efficiency. Smart Control: 7-day programmable schedule to provide comfort when you need it. Complete System Design: Warmzone radiant heat experts provide complete, professional system design services. Premier Construction: The under carpet floor heating element consists of an aluminum foil heater with twin conductor, with primary insulation of Flouropolymer, sandwiched between two layers of thin, specially reinforced aluminum. Safe: The FloorHeat Under Floor heating system conforms to the product safety requirements as per latest EU Directives and is UL/cUL Certified and GFCI protected. Environmentally Friendly: Over 90 percent of the heating element consists of metal (primarily aluminum), which is considered as a “green-metal”. The system does not emit any green-house gases while heating. Top Warranty: Manufacturer warranty of 5 and 10 years, covering parts and labor. Warranty covers 5 years for under carpet applications and 10 years for under laminate or floating wood floors.